My version of the famous Korean napa cabbage Kimchi. 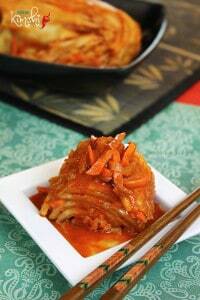 Delicious easy to make Vegan Kimchi that goes so well with a lot of dishes. No onion or garlic. A bite into a seemingly spicy piece of pickled napa cabbage opened up a whole new world for me when I discovered kimchi for the first time at this Korean restaurant called The Hop House in Dublin, Ireland. Crunchy, juicy, tangy and hot was really quite a mouthful of surprise from what looked like some humble morsels of cabbage neatly stacked in a small dish. I had never tasted kimchi before, nor did I know what it was. The menu labelled it as ‘V’ for vegetarian and it definitely caught my attention. Being the adventurous type when it comes to food, after confirming with the waitress whether it was also vegan, I had to order kimchi for the first time and was so glad I did. I even ordered more to take out at the end of my meal. Despite my avid love for anything pickled and fermented, I had never tasted anything quite like kimchi before then and it never occurred to me whether kimchi could be made at home; the flavour was so distinct. So, whenever Kevin and I wanted some kimchi, we would just go out to lunch or dinner at The Hop House. Well, it was also the perfect excuse to just enjoy some great Korean food too! After moving to Canada, we could not really find a Korean restaurant within reasonable distance from where we lived and I was starting to miss some good tongue-smacking kimchi! It didn’t take me long before I started to look for a homemade version of kimchi. 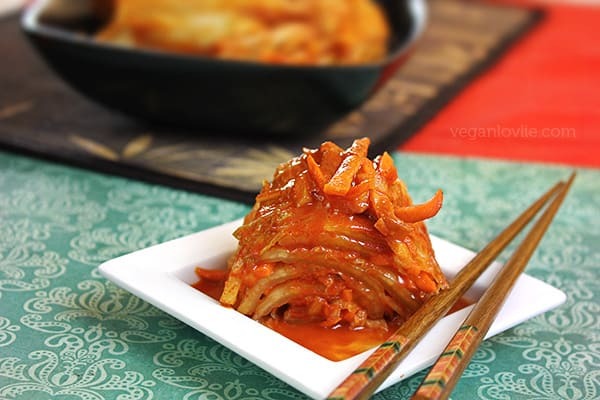 A quick search online revealed that kimchi is not by default vegan and there were so many different kinds of it using different types of vegetables too — everyone seems to have a somewhat different version of it. So, I roughly based myself on Maangchi’s non-vegan version and veganised/adapted it to suit my own taste. 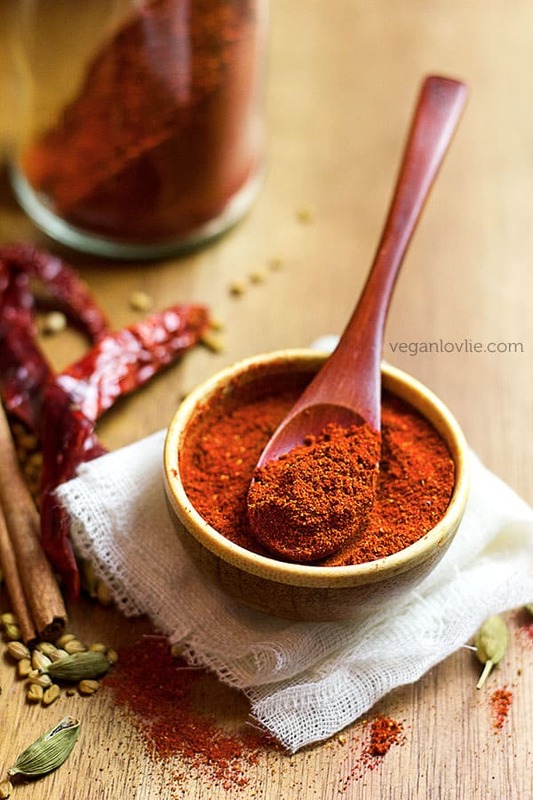 Although, I could not find any Korean red pepper flakes close to where I live and neither did I want to order online (shipping costs being more than what the product was priced at!). So, I substituted the pepper flakes with my usual chili powder. I was more or less experimenting as up until now, I was a lot more familiar with other methods of vegetable preservation like achard and pickling. Even though Korean red pepper flakes does add that extra depth of flavour aside from the heat, with the fermentation and juices released by the other vegetables, this vegan kimchi was just as tasty. I wouldn’t say I am a kimchi pro but after making my second batch of vegan kimchi, I quite got the hang of it and now understand the process and combination of flavours a lot better. Although, since I do not consume onion or garlic, I did not add any in my version here but feel free to add these in according to your taste and for some added health benefits. Speaking of which, kimchi is a probiotics powerhouse that is beneficial to both our gastrointestinal and immune systems. Another great reason to go and make some! I did not sterilise the containers or jars that I used for this small batch of kimchi but I do recommend that you sterilise your jars by boiling them for 10-12 minutes or leaving them in a 200° Celsius (400° F) oven for about 15 minutes if you are making a larger batch to store over a longer period of time. The kimchi obtained from one cabbage usually last me about 6 weeks and I do consume it quite often. 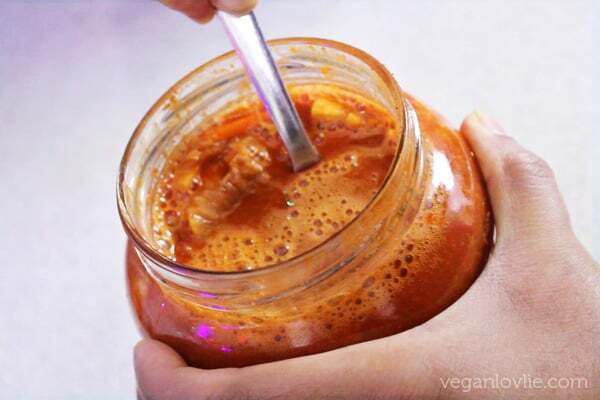 In this video, I take you through the step by step process of making my version of Vegan Kimchi. 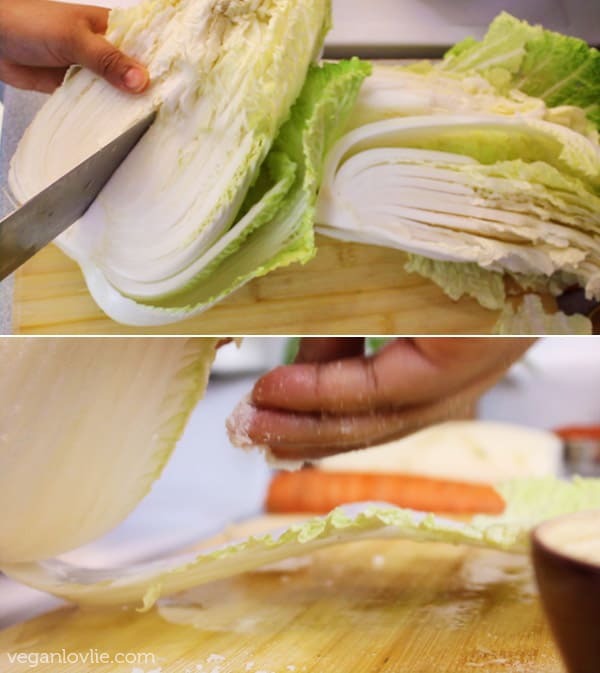 To cut the cabbage into quarters lengthwise, first make a short slit in the base of the cabbage, enough to get a grip on either half, and then gently pull the halves apart so the cabbage splits open. Now, split each half into halves again by making a slit again through the core and gently pull apart. Cut a bit of the core off as the cabbage leaves should be loose but still attached to the core. Wash each cabbage quarter thoroughly and in between the leaves to remove any mud or dirt. Shake to remove excess water. Sprinkle the sea salt between the leaves by lifting up every leaf and getting salt in there. Use more salt closer to the stems, where the leaves are thicker. Let the cabbages rest for 1 1/2 to 2 hours. Turn over every 30 minutes, so they get evenly salted. To know when the cabbage is ready, do a little snap test. The cabbage leaf should be very pliable but it should still be able to snap at the bent end; the leaf should not be limp. After 2 hours, wash the cabbage quarters 2 – 3 times under cold running water. Wash thoroughly to remove the salt. While the cabbage is salting for 2 hours, you can make the porridge. Combine the water and the flour in a small pot. Add the sugar. Mix well with a whisk and let it cook over medium heat for about 10 minutes until it starts to bubble and is of a thick consistency. Remove from the heat and let it cool off completely. When the porridge is completely cooled, mix in the pepper flakes, ginger and soy sauce. Mix well with a wooden spoon until everything is well combined. Add the radish and carrot. Mix well. 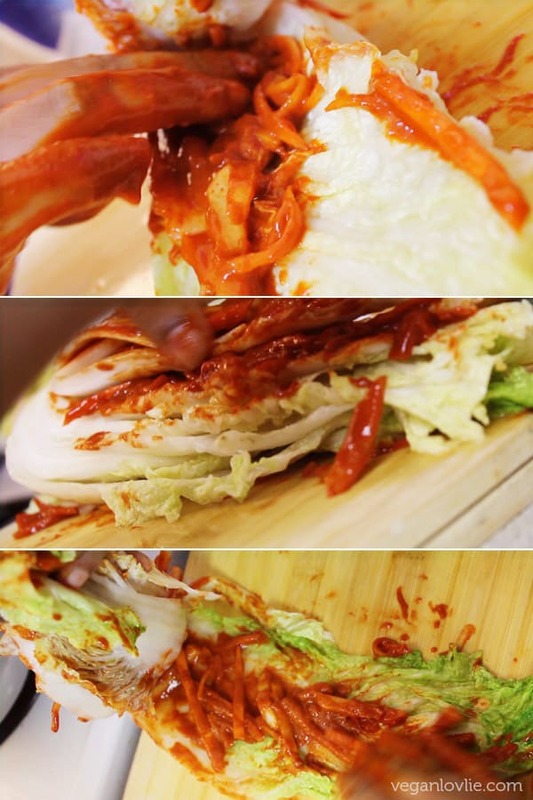 Spread some kimchi paste (with the vegetables) on each cabbage leaf. When every leaf in a quarter is covered with paste, wrap it around itself into a small packet, and put into the (sterilised) jar or glass container. 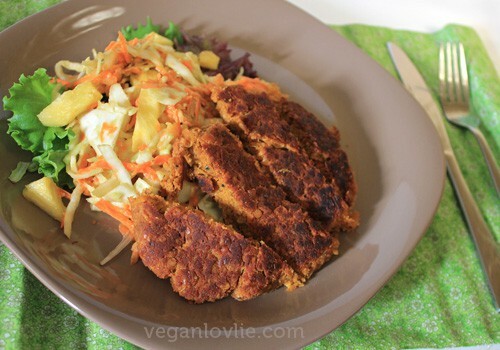 Alternatively, you may cut the cabbage into bite size pieces either before or after seasoning and then put it into the jars for fermentation, whichever is easier for you. Eat right away, or let it sit on the kitchen counter for 1 – 2 days to ferment before transferring to the refrigerator. The fermentation will start within the next few hours and, depending on the room temperature and humidity, it may take more or less days. I suggest you place a plate or bowl under the containers during the fermentation process and do not close the lids too tightly (or the jars may explode!). The more you leave it to ferment, the more sour it will become. 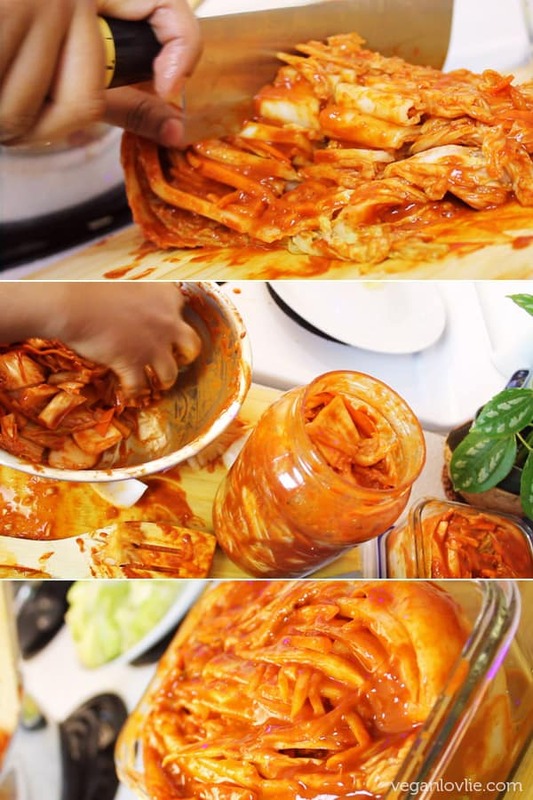 After 2 days, you may store the kimchi in the refrigerator to slow down the fermentation process although it will get more and more sour over time. I have been enjoying my kimchi with various dishes: with fried rice, over soups, in ramen just to name a few. 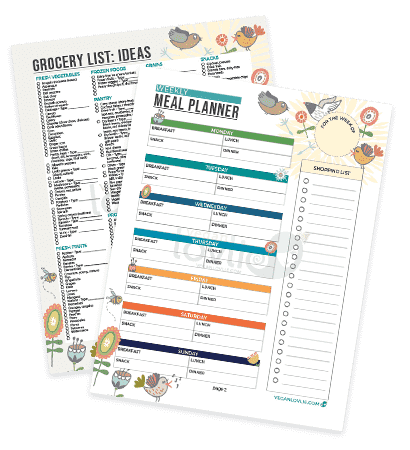 This recipe is a simple basic version. But for my next batch, I plan to experiment with adding some kombu or shiitake mushrooms for different flavour. My version of the famous Korean napa cabbage kimchi. This is an onion- and garlic-free version but you may add these as per your liking. 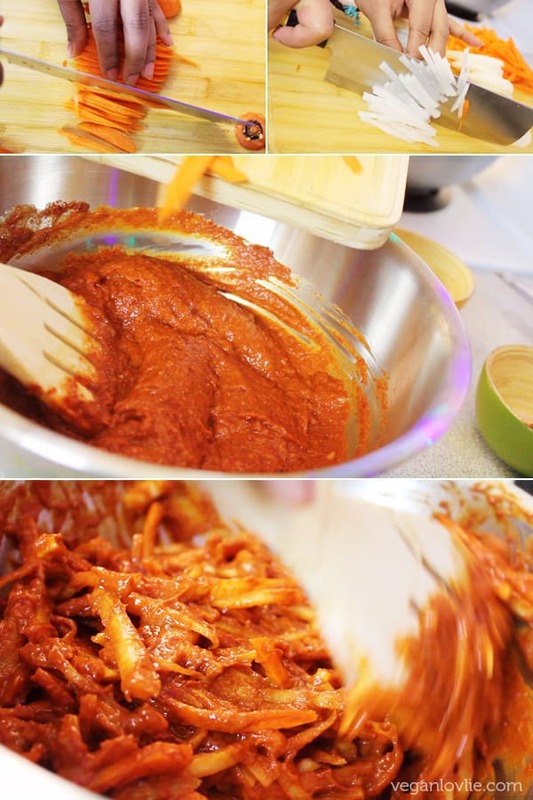 What is your favourite way of eating kimchi? Do you prefer it as a condiment or mixed in other recipes? I’m so happy you found some vegan-friendly Korean food in Dublin, that’s amazing! Kimchi is one of my favorite rice topping ingredients! 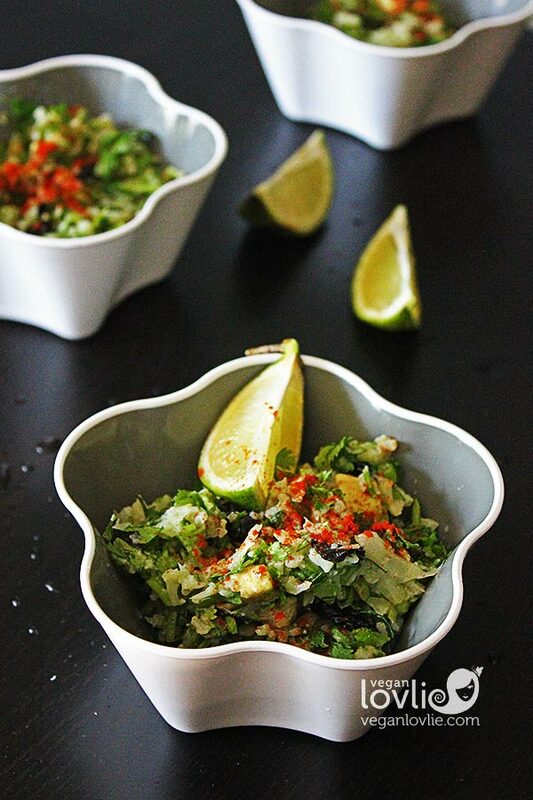 Your napa cabbage kimchi version looks delicious! There are a few nice vegan-friendly spots in Dublin. Quite a few different cuisines too but i think the Hop House was my favourite, I loved their bibimbap! Your kimchi looks so good. We can find kimchi here, but it's hard to find it without fish sauce, except for the very expensive organic kind. I really should make it myself. Thanks for working out a recipe. Your kimchi looks positively delicious! Question: if you're planning to add kombu, will you be adding a few dried pieces, or will you cook them first to soften them? For the kombu, I will either soak them in hot water or boil them. And then I plan to use the water rather than the kombu itself. I find kombu to be quite tough to eat, so I might just add a few thin tiny pieces but I will use the water to make the porridge. Maybe some crushed nori might also work instead. It's so hard to find veg*n kimchi where I am, I've often thought about making a big batch of homemade stuff. I always thought it might be too much in the way of hard work, but your recipe looks distinctly doable. Looking forward to giving it a try.